User-friendly Manufacturers are focusing on making ride-on equipment simpler and safer to use. For lawn care operators (LCOs) who have embraced the benefits of ride-on machines, pushing a spreader or pulling a sprayer hose is now a thing of the past. Technology has made ride-on spreaders and sprayers easier to learn and operate while helping LCOs cover more ground in less time. The challenge of finding and retaining quality labor is one of the biggest factors driving growth of the ride-on spreader and sprayer market. LCOs are able to cover more ground in less time using ride-on machines than they ever could doing the work manually. Lloyd von Scheliha, product manager for Exmark in Beatrice, Neb., says when the company entered the ride-on spreader/sprayer space in 2015, it looked for ways to make the machines more efficient, more productive and less fatiguing for the operator. Ryan Cecil, partner at Go Green Lawn Solutions in Louisville, Ky., says productivity is the main reason his company started using ride-on spreaders and sprayers about six years ago. The company’s technicians are now able to treat up to 30 lawns per day versus the 15 to 20 they used to treat with push spreaders and chest sprayers. Cecil notes that he sees the biggest gains in productivity on lawns 10,000 square feet or larger. For lawns 5,000 square feet or smaller, Go Green technicians still utilize chest sprayers because Cecil says they are quicker and easier to use in tight spaces. Go Green Lawn Solutions is a $650,000 company that offers 80 percent lawn care and 20 percent pest control services to a 90 percent residential, 10 percent commercial clientele. 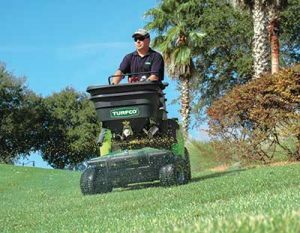 Productivity With increased demand for lawn care services, LCOs with ride-on equipment can add more clients and be more productive. Kinkead says LCOs need this newfound productivity to keep up with the increased demand for lawn care services. He credits this demand to the growing number of millennials who are willing to pay professionals to take care of household chores like lawn care and maintenance. LCOs are adding more customers from this group of homeowners who do not have the experience or the desire to do this type of work, Kinkead says. Manufacturers are also focused on making the machines easier to learn and operate. This focus helps reduce operator fatigue and get new employees trained and out in the field quickly. For example, Exmark designs its ride-ons with rear drives and front steering, which von Scheliha says gives better hillside performance and more control. Exmark also focuses on the machines’ capacity, so they can cover more ground before needing to be refilled, and size, so they can fit through standard 36-inch gates and other tight spaces. 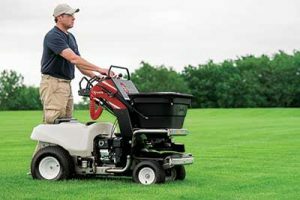 Kinkead says the emergence of ride-on machines has helped expand the lawn care industry’s labor pool. Because they are easy to use and operate, ride-on machines allow technicians to stay in the industry longer and have helped improve employee retention. “The image that we are a physically taxing business is a hard one for us to shake,” Kinkead says. “Lawn care company owners want to keep their older employees. To have a 55-year-old applicator is a big deal—we used to lose those guys. different brands of ride-on machines. The company utilizes manufacturer training programs when they purchase new machines and then takes that training in-house. Cecil says it takes a few months to get new hires accustomed to the equipment and out into the field on their own and adds that improved safety features, such as locking caster wheels and lower centers of gravity, have been welcomed additions. Cecil says that more competition in the ride-on market has required manufacturers to keep improving their machines. Social media and message boards are great places for LCOs to talk about the different types of machines available and to communicate with manufacturers about how to make them perform even better.